Languedoc-Roussillon also called France’s sunbelt is truly blessed with an almost unbroken beach in the Mediterranean waters, right from the Rhone to the Pyrenees. The region was formed by the merging of the two historic regions. Languedoc relates to the ‘language of oc’, in the locally spoken Occitan language. Roussillon was the name of France’s Catalonia. The region can be described as having the right mix between energetic cities and awesome medieval villages. You can make easy day trips to Spain’s Barcelona from here. The region is connected to Paris by the high sped train TGV. Due to its relatively cheap property prices, it is becoming increasingly popular with second home owners. The area is amongst the least industrialized in France with about 68% of its employed people engaged in the service sector. It has a spectacular 150 mile Mediterranean curved coastline. Apart from the sunny beaches that stretch continuously for four miles, Languedoc-Roussillon provides a wide range of wonderful landscapes. There are also vineyards with olive groves bordering them. Due to this scenic diversity Languedoc-Roussillon can never disappoint any visitors to France, whatever their expectations are. The town and cities here are of the ancient French type, with countryside and seas offering amazing views. The towns reflect a typical mixture of French and Spanish cultures, derived from their history. Languedoc was known as the ‘county of Toulouse’ during the middle ages. The Cathar religious movement originated in Languedoc in the 12th century. It was crushed by the Albigensian Crusade. The county of Toulouse was taken by the crown of France in 1271, and remained a part of France since then. The parliament of Languedoc that was later established in Toulouse was abolished by the French Revolution. The plateau of Gevaudan in the north has the Margeride or the 4000 feet granite massif, cutting across it. The northern region of Languedoc-Roussillon has vast pastureland, wonderfully interposed with heavy forests of fir, pine and birch. Mont Lozere and Mont Aigoual of the Cevennes in the South were the resistance war room during WWII. It should be noted here that R.L. Stevenson’s ‘Travels with a donkey in Cevennes’ is very relevant to the place even now, as it has been very little affected by modernization. One can still take to hiking along the 120 mile route, however without the donkey. You will find small villages separated by the chestnut grooves, in the lower valleys. The region hosts France’s largest national park, Parc National des Cevennes, which includes a 30 mile long canyon formed in the limestone plateau by the river Tarn. At the south of Cevennes, the coastal lagoons offer a wide range of wildlife. The coast is dotted with fishing villages and resort beaches. You would love to watch the streams tumble down from Vidourle and Gard rivers to irrigate the areas’ vineyards and orchards. 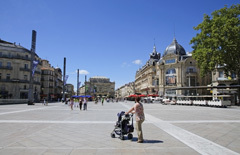 Montpellier, the capital of Languedoc, is well known for its medical school and has the Musee d’Anatomie or the museum of Anatomy, which exhibits some of the gruesome encounters in medicine. About a quarter of Montepellier’s population is made up by its students. One can take a long walk along the Esplanade Charles-De-Gaulle to see the several attractions located along the stretch, which includes the art museum Musee Fabre and the 24 acre park Champ de Mars Garden, which also has an Eiffel Tower. Uzes is another stunning Languedoc town with Roman connections. The splendid architecture and its wonderful squares are ideal for a pleasant walk followed by lunch or coffee. The castle of Le Duche is very impressive with its tower offering a superb view of the countryside. The Pont du Gard is a prominent landmark with over a million people making the pilgrimage to it each year. The aqueduct was built in the first century AD, by the Romans and is today among the top five French tourist attractions. The town of Pezenas is somewhat more sophisticated than other comparable towns in Languedoc-Roussillon. It boasts several arts and crafts galleries and with many antique shops at the western side, the town is indeed a must visit for any art collector. The Canal du Midi lazily and gloriously flows through the vines, well lined with trees and interposed with lovely stone bridges. One can rent a canal boat and visit the beautiful villages along its banks. St Guilhem-le-Desert is another cobbled street town that has been charmingly restored. The town sees a considerable number of tourists during the summer. The abbey, founded by Guile, is in the center of the town and is today a UNESCO World Heritage site. You can see the stunning limestone formations of the huge cave systems discovered in 1770. A small train takes you through the cave, offering you somewhat of a Disneyland feel. Summer crowds here are very huge. The town of Collioure, just a few kilometers from Spain, resembles more of an Italian seaside town. The town has notable fortifications and beautiful pastel houses. The Pyrenees which are often snow capped can be seen in the background. The Perpignan city is the last big city in Languedoc before Spain. You will find a mix of several cultures here including Roman, Catalan and North African. It should be emphasized here that in recent times, Jean-Marie Le Pen’s rightwing Front National Party, which is strong in the city, claims that the original white inhabitants of the city were dominated by the foreigners. The Palais des Rois de Majorque, Saint –Jean quarter and the Cathedrale Saint-Jean are well worth visiting.